Tinta cão, which translates to “red dog” in Portugese, is considered one of the five premium grape varietals for making fine port. 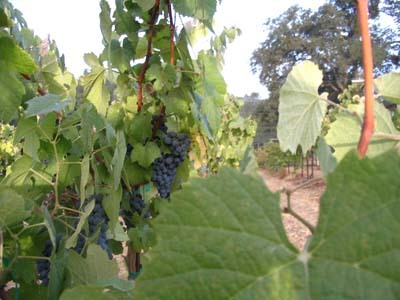 Tinta cão makes small clusters of small berries; the foliage on the vine is notably lighter green in color than many vinifera. Tinta cão has subtle flavors, more herbal/aromatic than outwardly fruity, with firm tannins and acidity. It contributes backbone to both dry red blends and port blends, in which it is thought to promote longevity of the wines. Though varietal wines have been made from tinta cão, the wine made from it has relatively muted flavors and is frankly best used as a blender. At Shaker Ridge, tinta cão (clone 1A) is grafted on St. George rootstock and is trellised with a horizontal cordon and modified vertical shoot positioning. The fruit typically ripens in mid-September.